The most important key when using a blackjack strategy chart is you are reading it correctly as it tells you when to hit, stand, split, double, or surrender and if you mix these actions up and perform them at the wrong time you could lose when you potentially could’ve won. There are two strategy charts, one for when the dealer hits on a soft 17 and one for when a dealer hits on a hard 17. It is imperative you know which rule variation you are playing when using these charts as there are moves that differ from one another depending on what the dealer does. There are also charts for other variations of blackjack, however these are less common. If you are playing at a land-based casino where you can’t set the pace of the game, it might be best to memorise key moves instead of the entire chart, to keep it simple in your head. For example, players should hit if you have from five to eight for a hard hand and on 12 to 15 for a soft hand; double on a 10 if the dealer has two to nine with a hard hand and on 18 if the dealer has two to six on a soft hand; and finally never split fives, or 10s. These aren’t specific rules you need to learn, but it is better to take some moves from the chart than none if you can’t memorise them all. While the strategy chart does not guarantee you will win if you choose to do the move it does mean you are playing at your best in terms of statistics. We mentioned above a few rules to possibly remember which are examples of optimal play, however we will give more depth to the following examples. 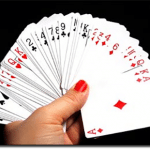 If the dealer has anything from a two to an Ace, players should hit when they have anything from a four to an eight with a hard hand. When a player has a nine they should hit on any card the dealer may have but double down if they have a three to six if possible. These are just some of the possible examples of playing at your optimum when you have a hard hand. Again, the moves vary between the two charts. 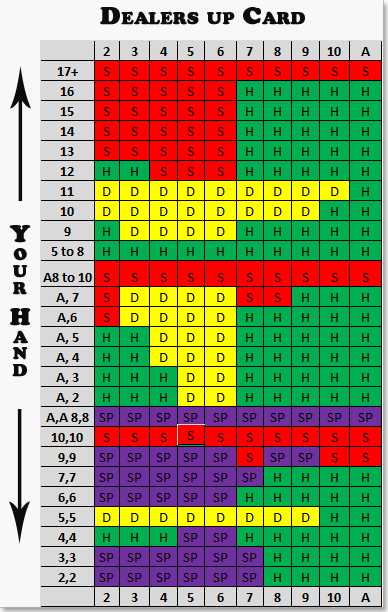 With a soft hand it is recommended to stand for more possible combinations when the dealer hits on a soft 17, and less when the dealer stands on a soft 17. An example of this is when a dealer has a six and the player has a soft 19, with the rules that the dealer has to hit on a soft 17, it is recommended players double down if available. When the dealer stands on a soft 17 it is recommended the player stands. There are a few combinations where this occurs so it is important to know which chart you need. As mentioned above it is suggested never to split fives or 10s. Splitting Aces and eights is a prime example of optimal blackjack play. It is also suggested to only split fours when the rule that you can split after doubling is in place but this only applies when the dealer has a four or a five. This isn’t all of the examples possible, rather it is just a select few so it is best you view the chart and try it out for yourself. Can I practice my blackjack strategy for free? All our recommended online casinos offer a free play mode so players can open up the strategy chart in a tab and try out the moves. Once you are ready to play with real money just change modes, make a deposit and you can get going. The best thing about playing online whether you are in free mode or not is that you can take your time. At land-based casinos and live dealer versions, there is a set pace, and a set amount of time to make bets. When you are first learning to use the strategy chart, it is best to take your time so we believe playing online is the best option. When you’re looking for a real money website to play 21 games at it is important to take several factors into consideration. It’s also very important to play at online casinos which are governed in a trusted location like the United Kingdom, Malta or Curacao, which are two of the online licensing bodies with strong reputations. Generally casinos we endorse to international players are approved by eCOGRA which is an independent auditing organisation, based out of the UK. 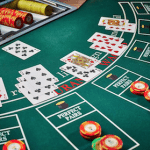 If you visit a casino and there are not many deposit options, you should steer clear of playing there because there are better options available, catering to several currencies and payment methods.